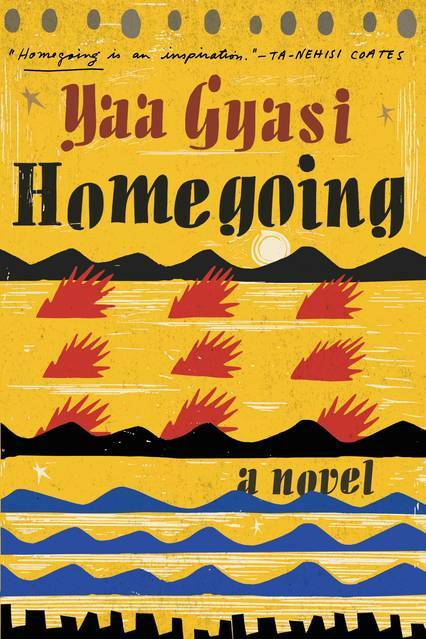 Like many of the books I review, I first heard about Yaa Gyasi's Homegoing in the New York Times The Warmth of Other Suns is very high on my list of books to conquer in 2017) gave it an excellent review. When I saw it in a local independent bookstore, I bought it. This is actually quite rare for me these days; I don't buy books any more as I get most of my books from the library. But sometimes, I'm willing to splurge on a hardcover book that I have never read before. I did that for Homegoing, and I'm so glad I did. The book will be staying on my keeper shelf. Yaa Gyasi's novel is about two sides of a family, completely unknown to each other. Effia, a beautiful girl growing up in what is now Ghana, and her descendants mostly stay in Ghana. Esi, Effia's unknown half-sister, is sold into slavery and her descendants live in America. Both sisters and their families are involved in and impacted by the slave trade. Gyasi follows the families through six generations, showing how much we all struggle to come to terms with our past and how other people's actions can impact our own lives. Many stories that follow one family over several generations are hundreds of pages long or sprawl out over a long series of books. In contrast, Gyasi contains her stories in 300 pages. Because of this, we do not get to know each character very deeply; when we leave a character, we rarely find out what happened to him or her, we only get glimpses from the next generation. This was very unsettling for me. I imagine it was even more unsettling for the people whose lives were completely upended through history. Gyasi's intent seemed more to give us a glimpse into a life, how slavery and colonialism ravaged that life, and how that individual strove to rise above it, from the late 18th century to the present day. In America, we learn about slavery (though we don't learn about it enough, and we learn about it more in the political sense than in the emotional and individual sense). I suspect that in Ghana, they learn about colonialism and the slave trade (though they probably don't learn enough, either). It is rare to see both sides of the coin presented together. Gyasi does that here to great effect. The impacts of slavery are felt far beyond America's shores, and the impact of the "peculiar institution" continues to this day. I loved how Gyasi brought this to life through individual lives. She obviously did not have the space or time to discuss everything, but she alluded to quite a lot. Mostly, about how difficult it can be to be black in America, and how haunting it is for people not to know where they come from and what family and traditions they are missing. In her review for the New York Times, Wilkerson expresses frustration at the way Gyasi shows the African side of the family as fighting for freedom, holding true to their traditions, and enjoying a rich culture, while the American side descends into stereotypes of men who like big butts and do drugs, women who feel like they don't fit in with anyone else because they like reading. It's a fair critique, though a lot of that might have to do with the fact that Gyasi did not give herself the luxury of spending many pages sharing the characters' stories with us. Wilkerson wrote a book about the Great Migration that in itself is 600 pages; it would be hard to get that sort of depth and nuance from Gyasi's much shorter novel. One could flip Wilkerson's frustration and say that Gyasi also seemed to gloss over the impact of colonialism and war on Ghana, with only brief allusions to the fight for freedom. The scope of world history over the past 250 years would be extremely difficult to fit into one book, so Gyasi chose to allude to more things than to bring them front and center. What I did love was the way she continued to weave the two sides of the family together, generation after generation. Recurring dreams that occur on both sides of the Atlantic, a fear of fire and an aversion to water. Even so loosely connected as the characters are, Gyasi makes clear that there is still a connection. Similarly, even as each character finds a way to remove himself or herself just a little further from slavery, you can see just how much slavery still impacts their lives. There are no tidy solutions here. The past happened, and we must accept that it continues to change and mold the world today. I tried to read this earlier this year and just wasn't in the right mood. I must get to it soon! This is near the top of my TBR stack right now. It sounds like the kind of book that would work well for me right now, when I'm less able to concentrate on long, deep stories. And I do generally like intergenerational books. I really hope to read this one in 2017. It sounds like something I will really like. Despite my documented dislike for family sagas, I thought Homegoing was terrific. I can see Wilkerson's complaint about the American characters falling into stereotype, but on the other hand, I felt that those characters were complex and interesting inside those stereotypes, if that makes any sense? Like I think even when human beings conform to stereotypes in some ways, that doesn't elide their complexity and interiority within that, and I thought Gyasi did a good job of depicting that. I keep bumping this one further up my list. I just found the audio on Scribd, and I'm in! OH, and you know how we said we should read Angela Davis together? I found her latest on Scribd. Let's do it!